Thisisn't a process you complete in just one afternoon, though. There are multiple steps and stages to go through, and though some children will take to it faster than others, it does require patience. With that said, a consistent and quality effort should enable you to equip your child with the necessaryskills to stay safe in the water within approximately a week. So, what do you need to do to teach your child to swim? Let's break it all down piece by piece. First — it's fun! There can be frustrating moments, but with a positive attitude and a focus on making the water a place that your child doesn't feel they have to fear, you can all have a good time every time you take them out for a swim lesson. These are memories you can enjoy looking back on for years to come as the start of something great. Second, you can keep track of their progress on your own, enabling you to spend more time on one technique before moving on to another. In the case of a swim class with other children, your child won't have as many opportunities to practice skills about which they feel less confident. When you're watching their lessons closely — because you're the one administering them — you can spend an extra session or two shoring up weaker skills. Third and finally, it could do you some good, too! Be honest: when was the last time you got in the water and exercised? Showing your child that you want to participate, also, can turn the event into an activity filled with family fun. Swimming together could become a new favourite activity in your family. What kinds of equipment do you need for this task? Before you enter the water, it's always wise to take a step back and come up with a plan. The first thing you should determine is where you'll give these lessons to your children. If you're lucky enough to have access to a pool at home, this is the obviouschoice. The sea is not an ideal choice, nor are other outdoor bodies of water — you should look for the most controlled environment possible. Public pools are the next best option to learning at home, but try to schedule your visits for times when there will be fewer people in the water. Thisaffords you the luxury of a less stressful environment and more room in the pool for teaching. As for equipment, some type of float is essential. 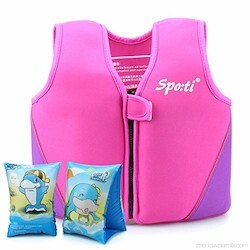 Whether you go for the classic "water wings" that fit around the arms to swim vests that provide your child with plenty of buoyancy, these are a must-have to enable your child to adjust to movement in the water before they understand how to harness their buoyancy. There are even shark fin-like floats to strap to your child's back — giving them the ability to float while swimming forward and adding a fun element to the lesson at the same time. Other than these basic safety and swimming aids, you do not need much more equipment to get started. Breath control is the first thing you should focus on teaching your child if they're of an age where they're ready to swim. For very young children, justspending some time in the water is an excellentway to start. Otherwise, you want to prepare your child for the sensations they'll experience during swimming, from being submerged under the water to water in their ears. "Blowing bubbles" is the most common technique for initialbreath control. Have your child partially submergein the water and blow bubbles using their mouth; this shows them how to breathe without accidental swallowing or breathing in the water. From here, it's important to establish confidence in moving through the water when they cannot feel the bottom beneath them. By taking hold of your child gently beneath their arms, you can movethrough the water while pulling them along; this movement will let them float horizontally, and you can begin to show them how to kick their legs for swimming. You can also face the wall of the pool and allow your child to use your body as a springboard to launch towards the edge. While at first,they will rely on the momentum they generate to make it all the way, eventually,they will begin to use their own body for forwardmotion. With some of the basics established, you can move on to more advanced skills: floating on one's back, the "doggy paddle" stroke, and perhaps even the basics of some standard strokes. During this process, emphasise the importance of having fun. Make upgames, tell stories, and encourage your child to embrace the opportunity for enjoyment. On unusuallyhot days, just sitting in the coolwater of the shallow end can be all you need to make your children more comfortable around water. Some anxiety and nerves are reasonable, of course — they're quite accustomed to walking on dry land, and swimming can seem very foreign at first. If your child does not want to swim on a particular day, don't force them into the water. That's a one-way ticket to ensuring they don't everwant to learn how to swim. However, gently encouraging them to push through potential discomfort and feelings of nervousness, perhaps by showing them how you can move through the water, can break down these barriers. Be patient, as not every lesson may go as well as you hope. How much time should you spend in the water? Remember, swim lessons won't transform your child into an expert overnight. In fact, the summer holidays may not even be long enough for you to fully establish the confidence you'd need to allow your child to swim without close adult supervision. Six months of practice is usually a reasonablebar to aim for, but the more time you can fit into the summer holidays, the better! Use this time to dispel any fear of the water your child may have by playing fun games and making every lesson unique and engaging. Think of how you would respond best if you were in your child's position: what are the most exciting things you can do to make swimming more fun? Aim to fit in two or three lessons a week during the summer period, as this will allow you to give them plenty of experience and spark the desire to continue swimming. Be careful, though...it can be quite an ordeal to explain to your child why they can't always go swimming when they wish! Could your efforts inspire a future Olympic swimmer? While teaching your kids how to swim is both a funand smart thing to do over the summer holidays, it is also an act that can lay down the foundation for a lifetime love of swimming. Not only does that boost the chances that your child will live a healthier lifestyle, but it also means that they always have a safe and productive outlet for their energy. Preparing them now will ensure they can enjoy pool parties with friends, swimming activities at school, and perhaps it will even ignite their competitive streak! Take the time to start planning now, and when the holidays arrive, seize the moment to make memories together as you teach your kids to swim. This article has been written for Sports Fitness, where you can shop for kids swimwear and equipment, take a look and get your children kitted out and ready.